Purchased at: From the brewpub in Rehoboth, DE. What makes this beer different: Unlike anything I have ever tried, so strong but so drinkable. Will I be drinking this again: Yup I have a 2007 in the basement, just wish it wasn’t so damn pricey for a bottle. 10/21/2010: 120 Minute is the last of the four “Minute” IPAs from Dogfish that I have yet to try. Already had the 60, 75, and 90 minutes… all of which were really good. They should try doing a 105 Minute IPA (half 90 Minute and half 120 Minute). This is one of the best smelling beers ever, but I gotta be honest in saying that I’m having a hard time putting my finger on what I am smelling because it is so unique. The flavor is awesome, and by no means does it suggest that you are drinking an 18% ABV beer. Sweetness far outweighs the sweetness even though this is an IPA. Lots of pale/caramel malt flavors, with a big punch of citrus hops. This has a barleywine type feel to it, but the mouthfeel is a bit lighter and less goopy. Over-average carbonation is what really makes this very drinkable for the alcohol content. Honestly this beer cannot be put into words, you have to try it for yourself. Awesome stuff. Picture of the day: Eat Mor Chikin! What makes this beer different: The hoppiest brown ale I have ever had. Will I be drinking this again: Yes this was good stuff. 9/20/2010: I remember trying this beer years ago and not liking it. Probably because I did not like beer with any type of hop presence until about halfway through my journey here on 365. Its been awhile and this is one of Dogfish’s most popular beers, so lets give it a go. Indian Brown pours out real heavy almost like a porter. The smell surprisingly is a bunch of chocolate, and hops in the mix. The flavor to me is really split 50/50 between bittersweet chocolate, and sharp biting hops. Both flavors keep each other in check in a delicious way. Very full bodied for the style with average carbonation. If I didn’t know any better I would have assumed this was a hoppy porter. Never-the-less this was a very good beer. Picture of the day: Not exactly a funny picture, but a wow picture. If money were not an object. What makes this beer different: This beer is a mess to be honest, crazy flavors coming from every direction. Will I be drinking this again: No way. 8/8/2010: I had this after a long day of golf in the 90 degree weather. I got 10 of my friends together to golf for my birthday, and I bought a cooler with mixed cans from Sly Fox (Royal Weisse), Oskar Blues (Yella Pils), and Bud Light Lime… Yes Bud Light Lime… Lets be honest its not THAT bad for a summer beer. Plus not everyone going to my outing was a craft beer head. The smells is mostly spicy, with a little bit of sweet honey. The flavors are all over the place. There is a lactose type flavor, a little bit of heat from the chiles, some black pepper, and some sweet malt. No sign of the cocoa nibs that were used I give Sam credit for trying to brew something to be historically accurate to the recipe they found (more info here), but the flavors just dont mix well. The only saving quality for this beer was the 9.0% ABV was very well hidden. Mouthfeel was a little heavy and very under carbonated. 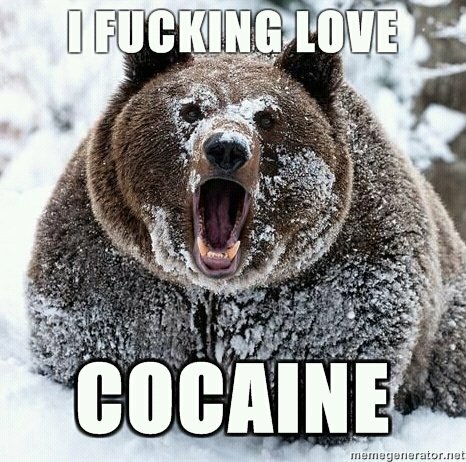 Picture of the day: This bear has problems. What makes this beer different: So amazingly smooth for how strong it is. Will I be drinking this again: Yes, I love a good strong beer that hides the alcohol well. 6/21/2010: This bottle of World Wide Stout is a 2006 vintage. It cost me $18 bucks, which I guess isn’t terrible considering fresh bottles run $10-$11 around Pittsburgh. I have only sampled WWS once before, and it was a fresh bottle. So I am pretty pumped to try a bottle with a few years of age on it. Smell is boozy as all hell, with a lot of roast malt, and maybe some dark fruit. I am completely expecting this first sip to be similar to when you pour a mix drink thats just a bit too strong, but thankfully I was wrong. The main three flavors are a lot of chocolate, coffee, and some raisins. Caramel and Molasses also jump out at me. It is really amazing how well the alcohol is hidden in this beer, and I am also amazed at how the body of this beer is not all that heavy. Its slightly on the heavy side of average, but not by much. How does Dogfish Head hide all this alcohol is such a mediumish bodied beer? This beer was worth every penny. It took me about 45 minutes to drink on an empty stomach, and right after I finished it I took a hour our nap. Well done Sam Calagione. Picture of the day: Super Mario Bros meets BP. Will I be drinking this again: It was very unique, but not sure if I would go out of my way to drink it again. 6/20/2010: Dogfish head has a little blurb on their website claiming that this beer is the oldest fermented beverage in the world. They say the recipe was found on the walls of King Midas’ tomb. Which is odd because as far as I know, the tale of King Midas is a complete myth. But what do I know? I just drink good beer and make websites. The pour of midas touch produces almost no carbonation at all. I am getting little to no smell with this beer. Maybe a little bit of money, but that might just be because I know its in the brew, and I’m trying to hard to find something in the nose that I am convincing myself its there. The flavor no doubt has a mead type characteristic. Honey is the main event here. The flavor is almost medicinal in a way? Really hard to put into words. This also has a lot of dry white wine characteristics as well. Not overly complex, again this is mostly about the honey, with some grape. Mouthfeel is pretty damn heavy, and it doesn’t help that there is little to no carbonation. Gets a little easier to take down as it warms. This beer is very unique, but not something I would go out of my way to drink again. Picture of the day: Bono is an evil evil man. Will I be drinking this again: I have another bottle but will probably bring it to the next Pittsburgh BA tasting. 6/18/2010: Picked this bad boy up from the brewpub while I was on vacation a few weeks back. One cool thing dogfish does is they make some of their vintage/one-of beers available to people who make the trek to Rehoboth. I also got a couple of 2006 World Wide Stouts. If I remember right this bottle was only $7 bucks? Not too bad for the big bottle. The smell of Wrath of Pecant is smokey, malty and nutty. The flavor is… unique? I’m not sure how I feel about it. Smoke is the first thing that sticks out, and its a weird meaty smoke. I guess the boatload of malts help balance it to a point… caramel, toffee, lots of brown sugar. This actually is a very sweet beer, but the smoked flavor just doesn’t work here. Oh and not to mention no sign at all of the plantain, carob and pecans mentioned on the label. The body is actually kind of light for how overly sweet this beer is, and it would benefit from a bit more carbonation as well. Will I be drinking this again: Its around every once in a while in the burgh, so I hope to. 6/5/2010: Normally I don’t post two beers from one day but, figured this one was rare enough to post about. I never noticed that the 60 and 90 minute IPAs have 6.0% and 9.0% respectively, and of course the 75 Minute breaks down to 7.5%. While at the brewpub I also picked up some Wrath of Pecant, and 2006 World Wide Stout. I was pretty bummed that they just sold out of the 2007 120 Minute IPA, as I have never tried it; vintage or fresh. 75 Minute IPA smells amazing, to be honest I can’t put my finger on the exact smells going on, but there are very fresh hops obviously. The taste is a perfect go between of the 60 and 90 Minute IPA. 60 Minute was a bit too hoppy for me, and the 90 Minute too sweet. This beer porridge is just right papa bear. Nice amount of sweet malt, and an almost even amount of hops. This was on cask so that gave it a pretty fresh and unique flavor as well. A lot fruitier than I expected it to be as well. Will I be drinking this again: Its a pub exclusive so probably not, but I would! 6/5/2010: Made the hike up to Rehoboth from OC MD to get some sushi and beer. First Cara and I stopped at Sting Ray to grab some sushi, and they have the best sushi I have EVER had. Not sure if any of you out there are sushi fans, but if you are ever in the area be sure to stop by and grab a sea bass roll. After we grabbed a couple beers at the Dogfish Head Pub across the street. I was pissed to find out they JUST ran out of Billy Budd, a combo of Indian Brown, 120 Min, and Palo Santo. I settled for the voodoo down, which is a brewpub exclusive apparently. Voodoo down smells like roasted coffee, with a couple tablespoons of honey into it (oddly enough how I used to drink my coffee back in college). The taste is very similar, lots of roasted coffee, and a bit of chocolate, finished of with a nice sweet honey kick. The flavors are a bit strong for how light bodied of an Imperial Stout this is, but the honey helps make up for this. Overall a very unique and in your face stout, but could have used a litttleeee bit of a thicker mouthfeel. Picture of the day: I’m a big soccer fan, and this sign is just great. Will I be drinking this again: Probably yes if I am in the mood for an IPA. 5/17/2010: One of my good friends Ray is the GM of a pretty fancy shmancy restaurant in the Strip District of Pittsburgh called Cioppino. I haven’t been there in awhile so I decided to stop down for a beer, and to BS with him. He also gave me a big bottle of Chimay Red that had been sitting on their shelves since they opened almost 3 years ago, should be delicious. If you in the Pittsburgh are and you are looking for a really good meal cooked by a very well known chef (Greg Alauzen), stop in and ask for Ray, let him know Drew sent ya. Cioppino is well known for their wines, not so much for their beer, but in the very near future I think Ray has plans to change that. Anyways the most “crafty” of the beers he had was the Dogfish 60 minute. I actually have never tried it considering I have just recently been getting into IPAs. I am heading to the brewery in a couple weeks and am hoping they have the 120 on tap to try. The 60 minute smells a heck of a lot like the 90 minute, but less sweet. I am assuming they use the same hop string? Checked out the history of the 60-90-120 minutes, and it doesn’t say. The flavor also tastes like a less sweet version of the 90 minute, much more about the hops than the malt. The dominant hop flavor here is floral, followed by some pine. Overall very good, but still a bit too bitter for me. A little more malt would have pushed this into the A- range. Picture of the day: So wait, you didn’t buy a gun? Purchased at: Some place in Robinson PA.
What makes this beer different: Stout with vanilla and oak flavors, no gimmicks. 5/16/2010: This beer was my very first stout that I liked; my gateway beer into the dark side if you will. I had this because of a recommendation by Mark Davis, former brew-master at Iron City, and current owner of The Bottleshop Cafe. I used to work at a restaurant right next to the cafe, and would stop in for a beer a couple nights a week after I got off my shift. Back then the place was small and had much better beer. Either way he introduced me to Oak Barrel Stout, and I have been a dark beer addict ever since. I have a few 2007 bottles sitting around, and this stuff ages beautifully. This bottle is a 2010, and they may have changed the recipe just a bit. The smell is semi-oakey, and a good bit of chocolate. The flavors are straight foward, vanilla, some oak, and a bit of sweet chocolate. This beer is not overly complex which is what makes it great. Vanilla is also one of my favorite flavors which helps. Mouthfeel is a bit light for a stout, which makes it very drinkable. The flavors are a bit less dominant than I remember. Either I have blown out my palette with these big heavy stouts, or they have changed the recipe a bit. Still one of my favorite accessible beers around for sure. Picture of the day: unemployed with a baby.